This is a close up of just some of what you might see at the annual Fisk Micro show. I try to offer my best work of the year, my first of a line or things that I might not ever take to a regular knife show. This is one of the things that makes the Micro show much fun for the folks. It is open to any collector of knives that wants to come to it. Please go to the Micro show link on the top of the page to find out the particulars of the show and who is coming next year. Both men and women purchase a slot in the show. It is the most relaxed and educational knife show that you will attend. 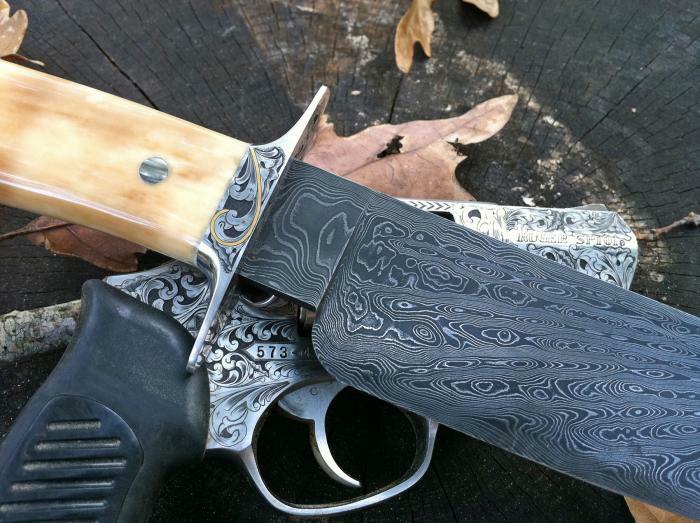 The photo showing here was of my personal knife for 2012 laying on top of my pistol that I engraved. You can learn more about this knife in the SOLD gallery. I will start posting up photogrpahs of the knives when I get them finished for the 2013 show.